The Many Benefits of Cabbage Juice From Fighting Cancer, Heart Disease and Boosting Gut Health..
Have you ever tried raw cabbage juice? Are you aware how healthy this juice is? Cabbage is one of the super foods. The next time you want to prepare something healthy, try this juice. Cabbage juice will help your body to get rid of toxins and hormones which can damage your immune system. This is because cabbage contains glucosinolates,a very important component. Cabbage juice is rich in antioxidants, vitamins E, C and A as well as phytochemicals which are very important for skin care. It is beneficial against acne, dryness and premature aging. 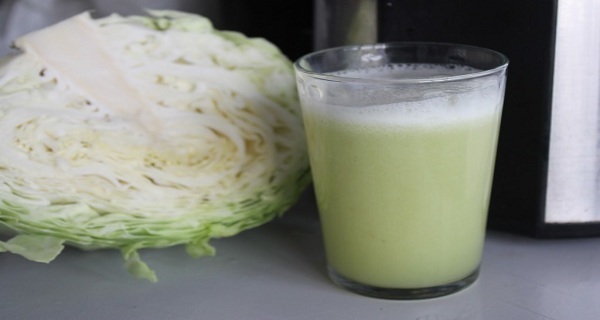 Raw Cabbage juice is rich in glucosinolates, which human body transforms into isothiocyanate compounds which are known to prevent cancer especially colon, bladder prostate cancer. Raw cabbage juice is extremely effective in the fight against obesity. It clears the upper part of the intestine and improves digestion. It also contains selenium which is proven to protect against cardiovascular diseases. Cabbage juice is rich in essential fatty acid Omega 3 as well, which is proven to protect against high blood pressure, stroke and cardiovascular disease. Cabbage contains cabbagen (vitamin U) which improves the stomach lining thus making it resistant to ulcers. The selenium in cabbage juice is effective in the fight against arthritis. Raw cabbage juice maintains the proper level of LDL or low-density lipoprotein, which is known as bad cholesterol. Red cabbage juice contains Omega 3 essential fatty acids. Cabbage is especially proven to have beneficial effects on the digestive system. It also has lactic acid which acts as a disinfectant in the colon. Amino acids are also found in cabbage juice and they are perfect cure for skin inflammation.